Being the game master is the most challenging task in a role playing game but this doesn’t mean that it is any less fun than playing a hero in the story. Without them, there is no story! I, personally, game mastered for a lot of years and I always loved doing it! For me, being a GM is like being a writer and a story teller, and through RPG’s I get to share my stories with others. It is a role that I grew very fond of, and lately I noticed that being just a player is not enough for me anymore (of course, I still play whenever I get the opportunity!). A game master has more than one role in a RPG. Firstly and most importantly, he is the one that comes up with the story and all the characters that are in his story. These stories are usually series of challenges and encounters that the rest of the players have to overcome in some way. A story can be as short or as long as you like. Some GM’s like to create stories that can be completed in a single session of play (these are known as one-shot adventures), while others create long complex stories that include many places to visit, a lot of characters for the players to meet and a greater quest to finish (these stories are usually long term campaigns that are played over a lot of sessions). Some GM’s like to consult their players and together, they create interesting stories that include the heroes backgrounds in some way. There are a lot of game masters that like to create their own worlds in which their stories could unfold. This can be pretty fun, but it is no easy task! Creating the world from nothing (like a fantasy or a sci-fi setting) is a long process. And not only that, but there are a lot of gaps to fill when you are creating one and many GM’s abandon the idea after some time. This is why many role playing games present you with a ready world, filled with strange wonders, cities, interesting people and technology. You and your players can jump right in with your stories and adventures and change it however you see fit. But if you want to create a world, start small! At least this works in my experience. There is no reason to immediately create 300 different kingdoms in your fantasy setting. No reason to create 1000 monsters and creatures. Start with a small village in a small region. This could be a place where the heroes will start their adventures. Maybe they will get to go to a cave nearby or an old crumbling ruin. Maybe a neighboring village will attack or monsters will pour out from a dark tower nearby. In this way, your world will expand slowly and you won’t get a mental breakdown trying to figure out all of the details at once. Know the rules! For some, this is the hardest part. As a game master you will have to know the rules best. And yes, it is a big book, but no role playing game will make you learn everything at once and most of them have intuitive and simple rules that are only there to enhance and add a dose of chance to your games. The rulebook is there for you! Do not be afraid to open it during the game and check out a rule. On the other side, never let the rules to become a burden for you! This is a problem that many GM’s face. Checking the rulebook often can become quite boring for everyone because by doing so, you stop the story in the middle of an interesting scene and the players might lose their concentration. It’s always better to improvise and come up with a solution on the fly and whenever you have a problem with a rule, try do to so. When you finish the session, it will be easy to open up the rulebook and find the rule that bothered you. And most importantly, next time you will know the rule! Believe me, the players won’t mind if you changed the rule so play could go on smoothly. The rules are there to serve you and not the other way around! 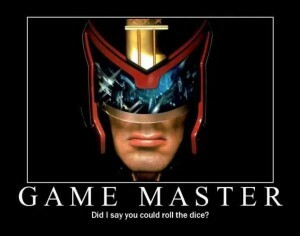 And this brings us to another aspect of game mastering, being a judge! This is an aspect that has to be handled delicately, always! Because it is your story or your world, you are the one that gets to decide how pretty much everything reacts to the players. If one of the heroes approach a dog, you get to decide whether the dog will be calm or if it will jump on the player and attack him. As a GM your word is final! Even if it is a strange thing that you say. If you want to create a world where rocks fly around people, you can! The trouble with this is that players can sometimes react poorly after hearing your decisions, and while you don’t have to explain anything to them, it is better if you have some sort of reasoning behind you decisions. Maybe those rocks are flying around because of an ancient curse that an angry orc shaman cast upon those lands. Be creative! If the players hear interesting reasons, they will easily and happily accept anything that you might want to throw at them. Always have fun! I can’t stress this enough! If you don’t have fun, it’s a waste of time. Whatever needs changing, change it. The rules are only there to guide you. Everyone knows that the key to a great game is to simply have fun!